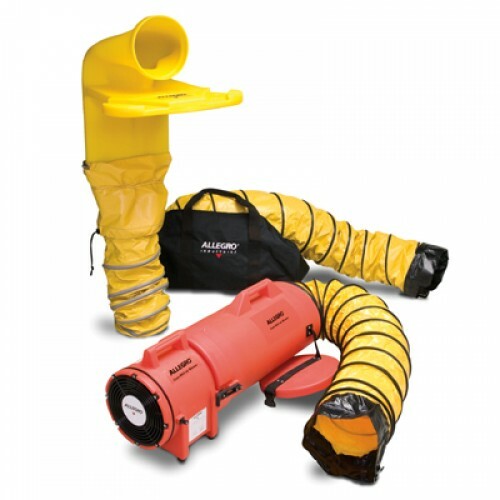 The complete Plastic Com-Pax-Ial Allegro Blower Ventilation System from Allegro includes everything you’ll need for your site. Included is the lightweight plastic blower, six feet and fifteen feet of ducting with a storage bag, and MVP (Manhole Ventilation Pass Thru). The Manhole Ventilation Pass Thru (MVP) is designed to maintain and redirect air flow with minimal restriction into manholes, sewers and tanks. The MVP is the first manhole system that combines the low profile manhole air vent, 90° elbow and built in mounting all into one easy assembly. Four Kit types available – AC or DC powered. The Plastic Com-Pax-Ial Allegro Blower System with MVP is a complete DC Ventilation System that includes everything you’ll need for your confined space site. Included is the lightweight plastic blower, six feet and fifteen feet of ducting with a storage bag, and Axial Blower system with MVP (Manhole Ventilation Pass Thru). The Manhole Ventilation Pass Thru (MVP) is designed to maintain and redirect air flow with minimal restriction into manholes, sewers and tanks. The Plastic Com-Pax-Ial Allegro Blower System features the MVP, which is the first manhole system that combines the low profile manhole air vent, 90° elbow and built in mounting all into one easy assembly.